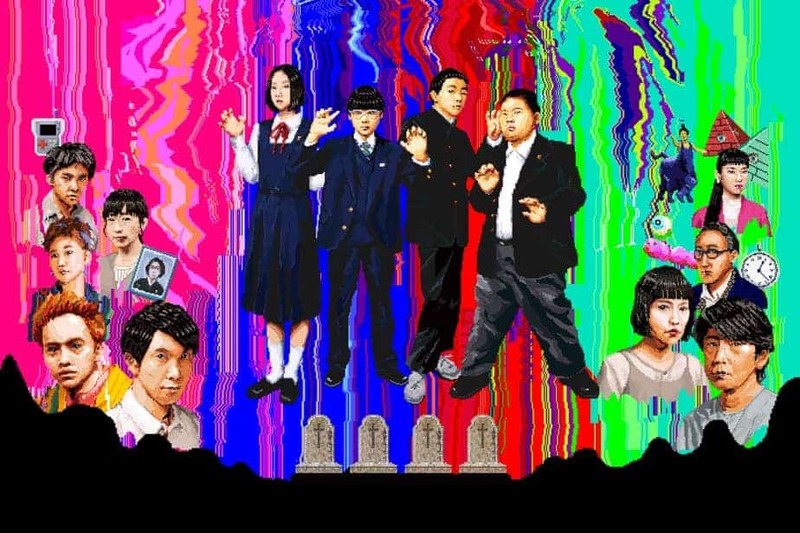 Makoto Nagahisa’s debut feature film “We are little Zombies” is an extraordinary and cynical metaphor about life. Four orphans – Hikari, Tekamura, Ishi, and Ikuko – meet by accident at a crematory, where their parents have just been cremated. No hopes, no dreams, and no sadness. As they team up and form a band by the name “Little Zombies”, the kids try to find their lost emotions. “Funerals need more humor”, says Hikari, who opens the prologue of the film. Everything is boring and stupid for him. Always in front of his game boy, he sees the world as a video game. Hikari’s view is projected onto the depiction of the film. 8-bit music and retro game animations drawing through a bright color world, constructed only by the narration of the 13-year olds. A world that is numb. Being raised into this state of mind, the story uses flashbacks to tell us the backstories of the respective child. Family drama, indifference, and wrong hopes shape the behavior of their parents. It is heartbreaking to see. But “We are little Zombies” is far from being categorized as a family drama. Actually, it is far from being categorized as a specific genre at all. Superficially, it is a coming-of-age movie about handling trauma. At the same time, it plays down the trauma, the death of the parents, and turns into a comedy. Therefore Nagahisa mixes a lot of styles. Almost none of the scenes are shot in the same way. Using camera angles in remembrance of old-school video games, shot in vertical birds-eye-view, the director catapults us in an arcade hall. In the middle of the film, the kids decide to form a band, sing about their loss and become very successful. Besides the musical aspect, which is implied in that turning point, we get to see media criticism. On the one hand, the kids are being exploited by the music industry, on the other, their fans start to stalk the ones who were responsible for their parent’s death. This leads to social media rants against innocent people. The refreshing mix of styles does not prevent the story from dipping about halfway through. I was surprised how the movie handles the topics of life, trauma, and death. Imposing sophisticated and philosophical questions, recited by inner monologues of children and presenting them with a punkish, unconventional concept of cinematography, is pretty unique. The creativity drifts up often and reflects the nonsense of a childish mind. Makoto Nagahisa gives a voice to his underaged protagonists, because no one but themselves can explain how it is to grow up in the 21st century. The great acting of the young cast underlines this intention. “We are little Zombies” contains certain traits of Shunji Iwai. Dealing with grief and teenage identity, the viewer is reminded of the melancholy of “All About Lily Chou-Chou” (2001). The rebellious music performance of the outsiders in “Swallowtail Butterfly” (1996), matches the band of the main protagonists. They are all outsiders, too. Being socially ejected, the group has to follow their own rules in order to get by. As we follow the kids on their trip through the city, we are more and more questioned by their emotional behavior. The film can be irritating at times, but it gets back on track towards the end. Even with the ending titles, the movie remains true to oneself, presenting one last self-reflexive pun to the audience. Being a sucker for stylish and unconventional movies, “We are little Zombies” is a 100% recommendation.